By the 1880s, the field uniform had finally adapted to the conditions of the West, and the soldiers liked it and wore it. Officers wore standard issue hats and uniforms, but they could be modified in any number of interesting ways. Enlisted men also wore standard issue uniforms, which could be modifed as needed in the field. It is important to realize that the military hat and uniform in the early period would be worn as issued in garrison; but field dress, of necessity, was a good bit more casual. 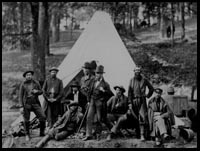 Soldiers frequently wore civilian purchased hats, shirts, and neckerchiefs. The uniform blouse, more often than not, was carried rolled up at the saddle. Buckskins were quite common, and when a hole needed to be patched, white canvas tended to be the only thing they had. Much of the time, in the field, the only way you knew who was who, officer or enlisted, was by personal knowledge, not by the hat or uniform. Uniform issue was spotty at best in garrison, and pretty much non-existent in the field. If something wore out on campaign, it had to be replaced with whatever could be scrounged or made on the spot. The last Apache campaign was in 1885-1886. Hired civilian US Army Scouts wore their normal clothing. Many wore buckskins, and their favorite cowboy hat. One frontier scout's hat of choice may be a felt Mexican type with silken cords around the crown, and silver bullion embroidery along the brim and crown. Another frontiersman scout may sport a wide brim hat similar to a plantation hat, a common style of the period.